Martin wanted to give Juliet a special ring to celebrate their 25th wedding anniversary. He knew she would love a design inspired by the influential Arts and Crafts Movement that began in Britain around 1880. This striking mixed metal design incorporates 9 carat white and yellow gold in unique decorative leaf shapes. 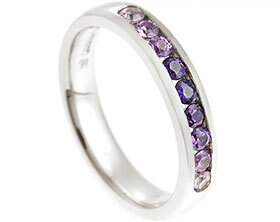 Juliet also loves the colour purple so three round purple sapphires have been grain set within the leaves. Bespoke 18ct white gold oval violet sapphire eternity ring. 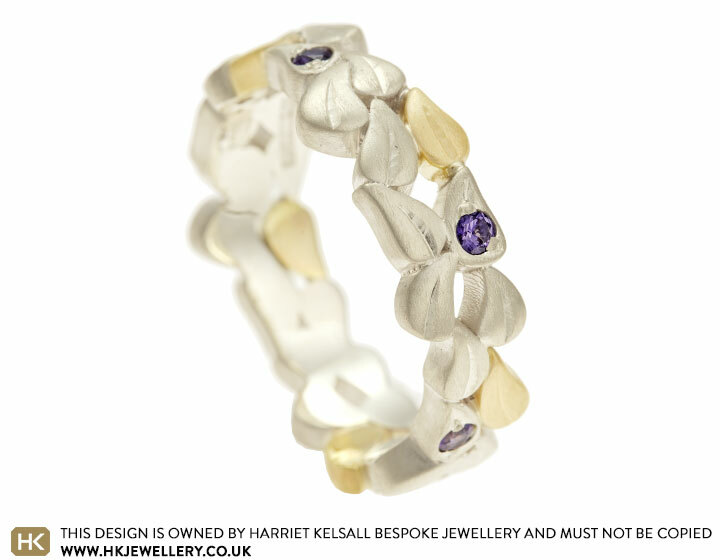 18ct yellow gold eternity ring with lilac sapphires and diamonds.